For those of you using Google Alerts or some other service to monitor web pages on Bike Fridays, don’t get us confused with the other Bike Friday. It turns out there are a bunch of Toronto, Ontario, cycling advocates putting together just about every arm of pro-cycling work including Critical Mass, recreational rides, and benefits to commuters into one handy-dandy little do-it-yourself package. Almost makes me wish I was there! Someone in Toronto needs to start a Bike Friday Bike Friday!!! I’ve written before about the bike-positive celebration that Critical Mass is. 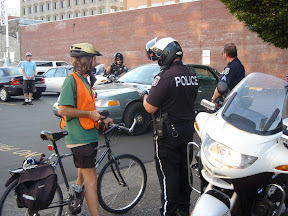 I’ve showed how some places (New York City, Eugene) have a very difficult time getting the local law enforcement to work peacefully with the cyclists. A recent article in a local Eugene paper covers how bad it is and what a great contrast it is to places like San Francisco and Portland where the cops even participate. This response from the Chinese police is perhaps the most interesting. All seriousness aside, I’m a bit wary to join up with Eugene Critical Mass anymore despite the fact that I really enjoy it. Last time I went, it was right after the aforementioned article was published and a lot of people showed up because of it. Also, it seems that the cops practiced a little more restraint. But not enough. Mid way through the ride, they picked out the one visitor from out of town and surrounded him with three cops. The main problem was that he was at the tail end of the group which had just turned right at a stop light. It turned red just as he was going through. This is how Eugene says “welcome to our town” I guess: harassment and unnecessary fines. It’s sad, because they ruined an otherwise good thing. The problem, I might add, is not that anything really illegal is happening. The problem is ultimately EPD which doesn’t have a good reputation anyways. Their abuses of power are well documented. Such misuse of state-granted authority the real examples of terrorism in this country.